Croatia would have liked the look of a qualifying group featuring Iceland, Turkey, Ukraine, Finland and debutants Kosovo, but an inconsistent campaign meant that their journey to Russia was more complicated than it might have been. After a promising start, defeats in Turkey and Iceland, together with a home draw against Finland, led to manager Ante Cacic – who had led them to the last 16 at Euro 2016 – being replaced by Zlatko Dalic two days before a crucial trip to Ukraine. 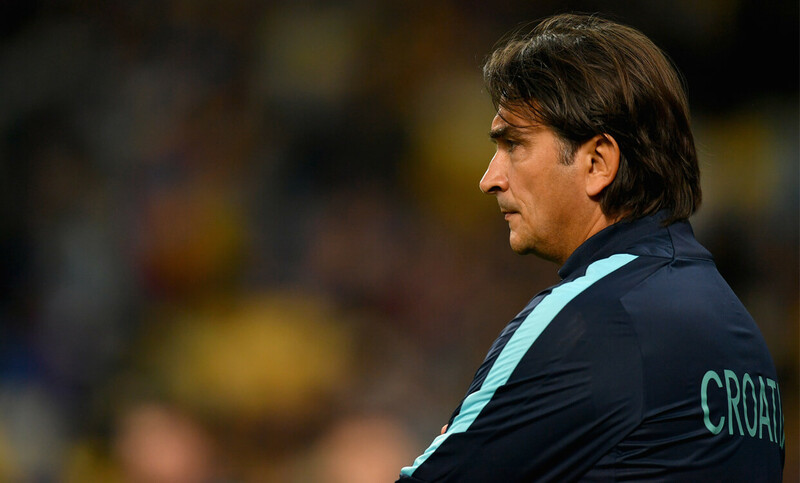 Dalic inspired the 2-0 win that saw them into a two-legged playoff against Greece, which was won 4-1 on aggregate. Experienced striker Mario Mandzukic (below) top-scored with five, but there are goals throughout the squad – five of the group heading to Russia are in double figures for the national team. At the other end, Croatia were susceptible to late goals during the qualifiers – both defeats came to strikes in the last 15 minutes, and it was a 90th-minute Finland equaliser that cost Cacic his job. A campaign-changing result at the Laugardalsvollur stadium dealt a blow to then manager Ante Cacic’s side, with a stoppage-time header from Bristol City defender Hordur Magnusson enough to seal a crucial three points for the eventual group winners. Croatia had enjoyed 59 per cent possession and dominated for large periods, but only managed to register one shot on target during 90 minutes. The away side set up in a 4-3-3 formation but lacked the creative movement and penetration that could have created more chances. Iceland were happy to wait for their opportunity, which came in the form of a set-piece – a definite weakness of this Croatia side. The visitors badly missed the intelligent distribution of Barcelona midfielder Ivan Rakitic in deep central positions, which meant that Luka Modric and Mateo Kovacic were forced deeper to find possession. This meant fewer players further up the pitch and less impact in key areas. Having secured second place ahead of Ukraine in Zlatko Dalic’s first game in charge, Croatia headed for the playoffs – and they delivered an accomplished display in the first leg against Greece in Zagreb. First-half goals from Modric, Nikola Kalinic and Ivan Perisic (below) did the damage in a 4-1 win from which Greece couldn’t recover. Croatia operated in a 4-2-3-1, with Rakitic and Inter midfielder Marcelo Brozovic playing in the deeper positions from where they managed to dictate matters. This freed up Modric to play in the number 10 position, where he was able to create a host of problems for a Greek side that offered little resistance. Full-backs Ivan Strinic and Sime Vrsaljko created two of the home side’s four goals on the night, with Atletico Madrid right-back Vrsaljko a particular threat all night. Croatia’s most experienced and possibly most important player, Modric is one of only six men to have played 100 times or more for the national team. Known for his precise passing and creativity, the central midfielder will be vital to his team’s hopes in Russia, where he will be featuring in his third World Cup. Modric began his career at Dinamo Zagreb, where he enjoyed five years and won three domestic titles before moving to Tottenham Hotspur. It was in London where Modric really built his reputation, before securing his big move to Spanish giants Real Madrid in 2012. His time in the Spanish capital has been highly successful, headlined by no fewer than four Champions League wins. In Russia, we can expect to see Modric (below, right) playing in a more advanced role for Croatia than he occupies at Real, most likely in the number 10 position behind a lone central striker. 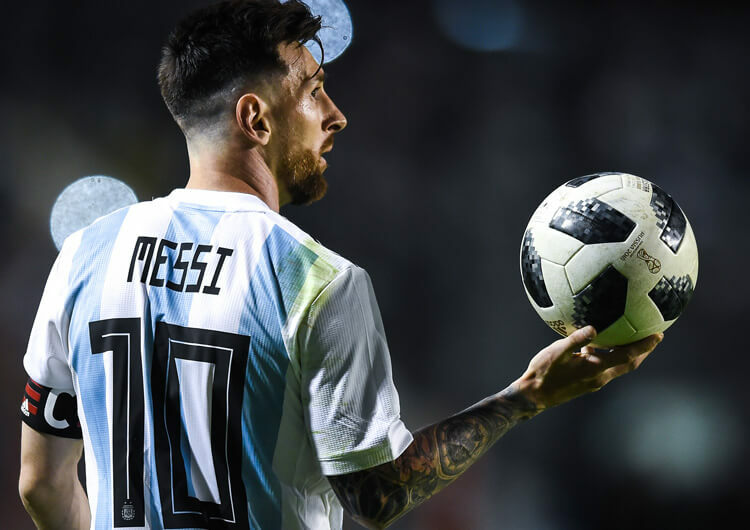 The captain of the side, he will also be charged with the responsibility of unlocking defences in a tough group: Croatia are in with Argentina, Nigeria and their old qualifying foes Iceland. Perhaps best known to England fans as the man sent off against Arsenal in this season’s Europa League semi finals, Vrsaljko is an increasingly impressive full-back who played a central part in the playoff victory over Greece that earned Croatia their place in Russia. The 26-year-old (above, left) began his senior career at Dinamo Zagreb, but after four straight titles left for Italy in 2013. After three seasons in Serie A – one with Genoa, two at Sassuolo – he joined Diego Simeone’s Atletico, where he was part of the team that defeated Marseille in last month’s Europa League final. We can expect to see Vrsaljko getting forward plenty in Russia, sometimes as the highest and widest player on the right – which allows whoever plays in front of him, most likely Kalinic or Perisic, to drift into central areas. He has a deadly delivery from wide areas and is a likely source of assists for as long as Croatia remain in the tournament. Another of Croatia’s big names, Rakitic will be central to any success the national side has in Russia this summer. The Barcelona midfielder made his debut against Estonia in 2007 and has since racked up more than 90 appearances for his country. The midfielder made his senior debut at FC Basel in Switzerland, the country of his birth, before moving to Germany and Schalke two years later. An impressive spell in Germany earned Rakitic a move to Sevilla in 2011, where he eventually caught the eye of Barcelona as a potential replacement for the legendary Xavi. Rakitic has enjoyed a successful spell at the Catalan club, winning three La Liga titles and one Champions League. The 30-year-old will dictate Croatia’s game from a position just in front of his defence. It is his presence that gives licence to his full-backs and fellow midfielders to attack in numbers, and his technical ability means he is always a point of contact if they need to recycle possession. Croatia can look lost without Rakitic in the side. He is that important. Dalic (above) took charge of Croatia with only one game of the initial qualifying campaign left, but a winner-takes-all victory in Ukraine secured the playoff against Greece that saw them on the road to Russia. The 51-year-old enjoyed a largely innocuous 17-year playing career predominantly across Eastern Europe, retiring in 2000 with the Croatian club Varteks (now NK Varazdin). He began his coaching career at the same club some years later, but apart from a long spell as an assistant within the Croatian Under-21 set-up he has managed mostly in the Middle East. In his short time in the top job back home, Dalic has set up his team to build from the back. He has the technicians to do that, but he is not adverse to direct play either – he takes with him to Russia a well-organised and versatile squad capable of scoring all different types of goals. 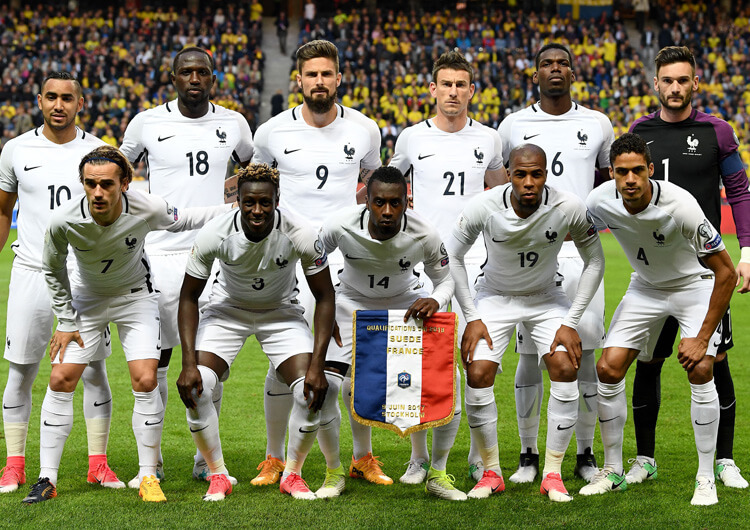 Croatia will look to play attacking, possession-based football and will set up with either a 4-2-3-1 or 4-3-3 formation. They will look to get the likes of Ivan Perisic or Nikola Kalinic in behind early, or alternatively send the ball directly to either Mario Mandzukic or Andrej Kramaric in the lone striker’s role. 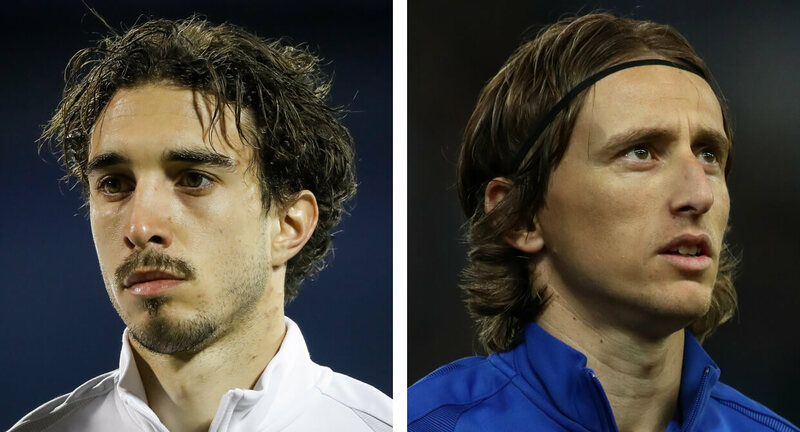 They can build centrally through the playmakers Modric and Rakitic, but their preferred style of attack is to use the full-backs, usually Vrsaljko on the right or less commonly Strinic on the left, to provide the width and get crosses in for the front players. The deployment of highly intelligent players such as Modric and Rakitic means that Croatia can co-ordinate various rotations and create overloads in areas that can hurt their opponents. Stopping them is easier said than done, but almost everything goes through Rakitic at some point (above, left) – kill his supply lines and Croatia are a much weaker proposition. Croatia had the best defensive record in their qualifying group, conceding only four goals in 10 games. The consistency of the ever-present Domagoj Vida and Liverpool’s Dejan Lovren at the back, and the balance provided by Rakitic in front, are both key to this – as is the team’s tremendous response in transition. Out of possession, we can expect to see Croatia fall back from their regular 4-2-3-1 shape into a 4-4-1-1 from which they can press in these organised units (above). This press is less about winning the ball back through tackles, more forcing passing errors from the opposition. As discussed, this is a team that is prone to conceding late goals – and their ability to ship at set-pieces might hint at concentration issues Dalic will want to address if his side are to go deep in Russia. The two games that Croatia lost in qualifying, in Iceland and Turkey, had one noticeable thing in common: the absence of Ivan Rakitic from the pitch. Should the Barcelona man be absent for any reason, Milan Badelj (above, right) is the obvious option – and while the Fiorentina midfielder is a capable operator, he simply doesn’t have the same quality, range or vision as the influential Rakitic in that deep-lying area. Elsewhere, Croatia boast a consistent and established core of players who played the majority of games during qualifying. There is ample cover in the full-back positions and the veteran Vedran Corluka (yes, he is still playing) could step in at centre-half, but further forward there would be a concern if key men such as Perisic, Modric or Kalinic became unavailable. Fringe squad members such as Filip Bradaric, Marko Pjaca and Ante Rebic don’t convince as players who could come in and really make an impact if required. That said, the formation and playing style of this team is unlikely to change regardless of personnel. Whoever starts up front will act as a target man, and the full-backs will always look to get forward and get balls in for supporting runners. They just need to keep Rakitic and Modric fit.